Killer Characters: Collections: Where Are Yours? Okay, so I like a lot of stuff. Guilty as charged. But I'm not a hoarder... yet. But the way my mother and sister go on, you'd think I was. Every time my mother comes up to Queensville, Michigan to stay at the family home for a week or two, she goes on a cleaning jag, (and this from a woman who hires someone to clean her condo in Boca) most of which involves taking all my kitchen displays down with a dismissive sniff, asking, "We can get rid of this, right?" I say no, and we get in a fight about it, and my dad intervenes and tries to pacify us both. Of course, that is just in the kitchen where my Pyrex and other stuff is displayed, and that is just the beginning of my collecting mania. I have made a real effort to contain all my various collections, though, even in my bedroom, where my mom never goes. To that end I picked up an inexpensive (cheap!!) shelf from a big box store - that was really fun to try to put together alone, let me tell you - and dedicated a shelf to each of my mini collections. 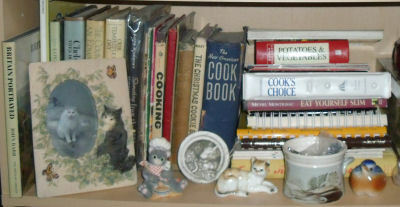 For example, the top photo is of some of my antique and vintage cookbooks. Not all of them, of course; I have far too many and most live in the kitchen, while other are in my office-slash-library. But at least some of them have a home with the detritus of my other collections. The next photo shows some of my most prized possessions... antique books. I have a small collection of Jane Austen, Charles Dickens, Maria Edgeworth, and Sir Walter Scott books (among others). The books are true antiques, dating from the late eighteen hundred and early nineteen hundreds. With them are most of the cat figurines my grandmother gave me. Many of those are antiques, too, and some even belonged to my grandmother when she was a young woman! And then there are my tea things... well, I don't have them all arranged yet, but I do have my books about tea arranged on a shelf! I'm not done rearranging by any means. Is any collector ever really done? But I feel like I'm making headway on containing my collections, and I do pare down when I can. But I love all this stuff!! How about you? Do you collect, and if you do, does anyone else in your household have an opinion on your hoarding... uh, I mean collecting? And how do you display your collections(s)? Sometimes, I just know I'm going to need a little scrap of fabric for an applique or other decoration--how can I get rid of it? Or all the others...??? Storage is ALWAYS a problem with crafting! Hoarding? We need those things. My passion is crystal and china. I pick them up at flea markets and yard sales. And I'm goofy for FiestaWare! So bright and cheerful! Fortunately, Aunt Faye had the foresight to build a lot of storage into her house. I still make good use of it. Doesn't everyone need special china for Christmas and Easter and Thanksgiving and . . . I know!! Where does one store all of their valuable collections? My problem is, I want it all where I can see and enjoy it! I collect cookbooks from all over he country. When we travel, we can not leave anyplace we visit until I find a local cookbook. I also collect Department 56 Snowbabies. My mother gave me my first Snownaby in 1990. 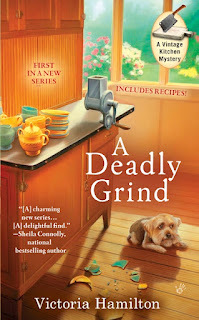 I absolutely love A Deadly Grind. 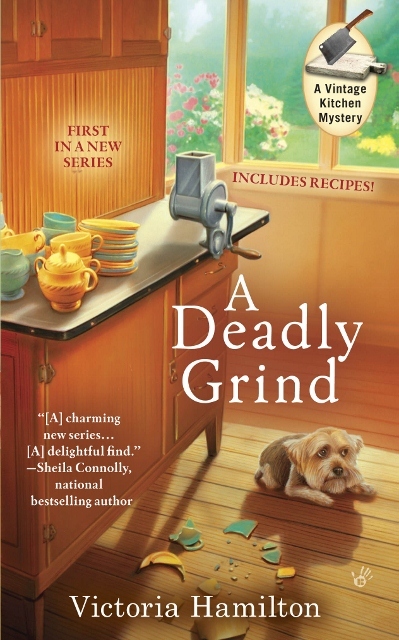 I can't wait to read he next book in the series.